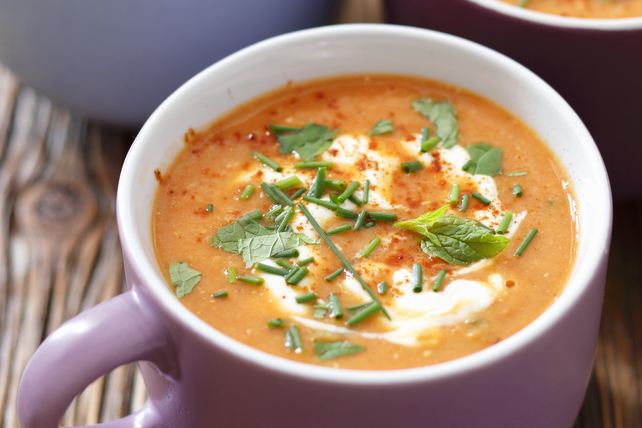 Looking for a fresh butternut squash soup recipe? Try our Roasted Butternut Squash and Tomato Soup. Roasting the butternut squash intensifies the flavour and combining it with fresh tomato juice, makes it a refreshing combination. Toss squash with half the dressing in large bowl; spread onto parchment-covered rimmed baking sheet. Bake 30 min. or until squash is tender, adding tomatoes to the baking sheet after 15 min. Meanwhile, heat remaining dressing in large saucepan on medium heat. Add onions; cook and stir 4 min. or until crisp-tender. Add cumin and chili powder; cook and stir 1 min. Add broth; stir. Bring to boil; simmer on medium-low heat 15 min. Remove from heat. Add tomatoes and roasted squash to broth mixture in saucepan; stir. Blend, in batches, in blender until smooth, returning each puréed batch to saucepan. Add coconut milk to saucepan; cook on medium heat 2 to 3 min. or until heated through, stirring frequently. Serve topped with sour cream, chives and mint. This soup can be prepared ahead of time. Cool, then refrigerate up to 2 days. Reheat in saucepan on medium heat just before serving, stirring occasionally. For more heat, season with additional chili powder to taste before serving. One serving of this flavourful soup provides an excellent source of vitamin A.